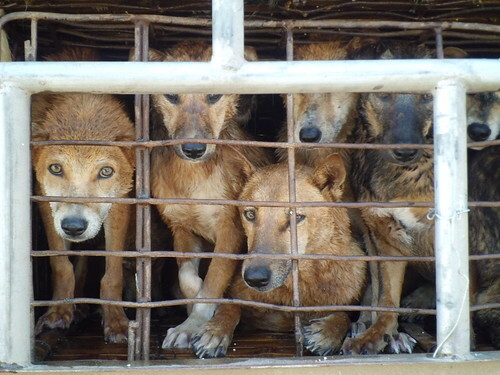 Over the last year, Vietnam has been rocked by reports of unprecedented levels of violence and criminality associated with the dog meat trade. Here are just a handful that saw the criminal dog meat trade hit the headlines and provoked further opposition to a cruel and unnecessary practice. In June 2014, three teenagers were tragically killed by fleeing dog thieves during a horrific knife versus stun gun motorbike chase. Three teenage vigilantes pursued a group of dog thieves by motorbike - slashing at them with knives. The thieves retaliated by shooting back with their homemade stun-gun, hitting one of the passengers and causing them to crash into an electricity pylon. All three of the teenagers died from their injuries. In October this year, Ho Chi Minh City police arrest a 23-year-old man for stealing 200 dogs over a seven-month period with the help of a home-made stun gun. In August 2012, a club-wielding mob in Quang Tri province beat two suspected dog thieves to death after a spate of thefts in the local area. This year, 10 people aged from 19 to 60 were charged with the killing. Their sentences prompted outrage and protest in the town as nearly 100 villagers refused to leave the courthouse. Following sentencing, 68 other people confessed to the same crime, creating an unprecedented legal wrangle for the authorities which remains on-going. In June 2014, a commune police chief was seriously injured in the north-central province of Thanh Hoa after being attacked by two dog thieves. The man was hospitalised after being beaten about the head, face and arms with metal bars. Hundreds of people in Dong Nai province beat a suspected dog thief unconscious in July 2014 after he was seen poisoning local dogs. The man was taken to hospital after police saved him from the mob's vengeance.